The fundamental principle behind frost seeding is that alternating freezing and thawing, along with spring rains, will help to incorporate the broadcast seed into the soil surface. Frost seeding of legumes and grasses can be used by graziers as a means to improve pasture yields or change forage species composition within the pasture without complete renovation. Frost seeding offers several potential advantages over other seeding methods, including the ability to establish forage in an undisturbed sod, a reduced need for labor and energy compared to conventional seeding methods, the ability to establish forages with minimum equipment investment, and shortened “non-grazing” periods. As with any method of forage establishment, seed to soil contact is critical for successful frost seedings. There are several management practices that can be implemented to help ensure good seed-soil contact. Pastures should be closely grazed in the fall or winter to open stands and expose soil. Sod-type grasses like bluegrass are the most difficult to make successful frost seedings in, especially where a thick layer of thatch covers the soil surface. In this case, frost seeding is not an ideal pasture renovation option. New seedlings must be given a chance to establish without excessive competition from plants already present in the stand. Reducing competition can be done in various ways. Grazing pastures down to 2 inches in the fall will help to slow regrowth in the spring. Graze frost-seeded pastures regularly in the spring and summer to allow for light penetration into the plant canopy. However, new seedlings should not be grazed until the plants have had time to establish adequate root systems. In many cases, frost seedings are made to introduce or increase forage legume species into a grass stand. Legumes are usually added to increase protein and energy content in pastures but will limit chemical weed control options. Experience has shown good results with red clover and birdsfoot trefoil. Alfalfa, alsike clover, and white or ladino clover have also been frost-seeded with varying degrees of success. Do not frost seed alfalfa in situations where alfalfa plants already exist in the stand; autotoxicity will prevent new seedlings from becoming established. In an Iowa State University research trial, red clover established quickly and remained productive for the first two years. Horse owners should be aware that mold infected clover can lead to photosensitivity, liver toxicity, and slobbers. When not infected with mold, clover is a good source of high quality nutrients. Introducing a legume into a grass pasture also limits chemical weed control options. Introducing a legume should only be done if the pasture is relatively weed-free and the horses are in need of additional energy and protein. Researches have had limited success of establishing cool season grasses (i.e. timothy and orchardgrass) in established stands of legumes via frost seeding. In a Wisconsin trial, perennial ryegrass and orchardgrass exhibited the best establishment success, smooth bromegrass was intermediate in establishment, while reed canarygrass and timothy had the fewest productive seedlings develop. Although smooth bromegrass was only intermediate in establishment, its sod-forming growth habit would likely result in additional plant formation from rhizomes. Ryegrasses do not typically overwinter in Wisconsin and should be seeded with the intent of filling single season forage needs. Ryegrasses and orchardgrass contribute to forage yield during the seeding year, however, smooth bromegrass and reed canarygrass often need a full growing season before plants become productive. When frost seeding both grasses and legumes, it is recommended to seed grasses separate from legumes (i.e. make two passes) when using a broadcast seeder because of the differences in seed density. The number of seeds that establish into productive plants will be a lower percentage with frost seeding compared to conventional methods. Frost seeding rates become a function of existing sod condition, species being seeded, and the desired number of seedlings in the final stand. Optimum seeding rates for specific pasture situations sometimes need to be determined by trial and error over several years. Recommended guidelines for seeding into existing forage stands are presented in Table 1. There are many excellent tools for making broadcast frost seedings. These include seeders that mount onto ATV’s and tractor 3-point hitch mounted seeders. When using spinner-type seeders, be sure to determine the effective seeding width for each seed type or mixture. This will vary between species. Frost seeding can be an effective, low-cost method to introduce new forage species into an existing sod or can maintain the current forage composition of pastures. To be successful, good seed-soil contact needs to be accomplished. Best results are obtained in forage stands of non-sod forming species without a thatch barrier. After frost seeding, keep competition to a minimum by frequent, short grazings, machine harvests or mowing. Frost seeding success is usually obtained with legume species like red clove, but some grasses such as ryegrass, orchardgrass, and smooth bromegrass can be successfully frost seeded with proper management. 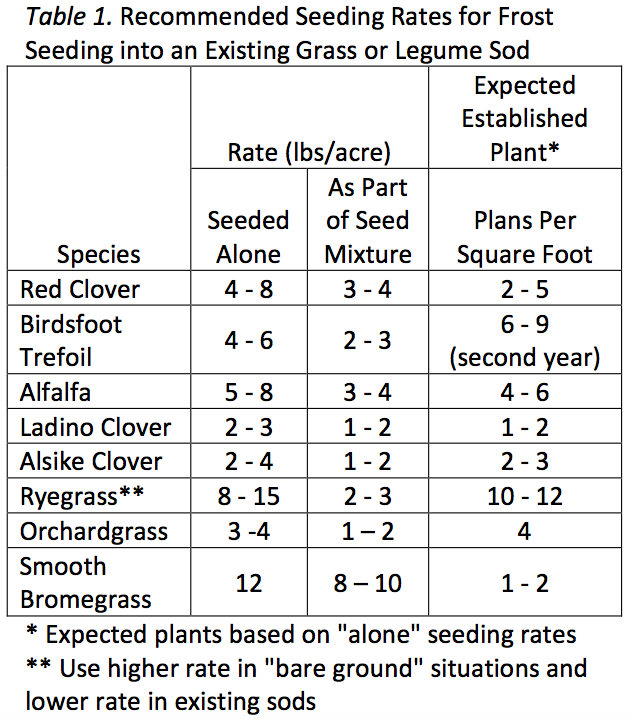 Base seeding rates depend on the current condition of pastures and the desired density of forage species being established. Find more University of Minnesota Extension horse related information and education opportunities on www.extension.umn.edu/horse. Copyright © 2011, Regents of the University of Minnesota. All rights reserved. For Americans with Disabilities Act accommodations, please call (800) 876-8636. The University of Minnesota Extension is an equal opportunity educator and employer.